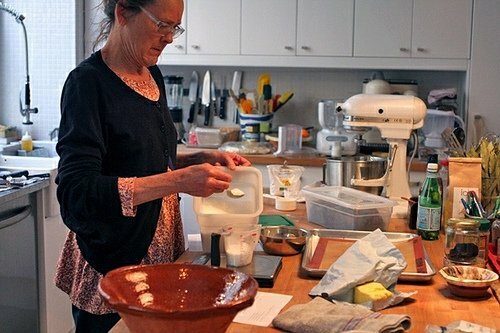 Terresa leads market tours and teaches cooking classes in Paris which focus on vegetarian cuisine and sourcing fresh, local, organic ingredients, and reaches out to people via her website, La Cucina di Terresa. 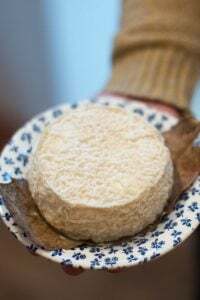 She takes folks to the markets and highlights the farmers and stands at the market, manned by the producteurs themselves and offers tastings of French natural wines. In fact, I often run into her at the market because we have similar taste in produce and we’re both always on the lookout for things like stewing greens and other unusual vegetables that are not so easily found. 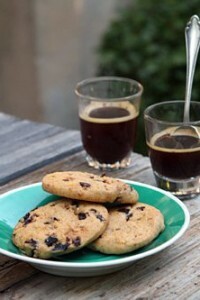 Some time back I had her Baci di Dama cookies, which I’ve been dying to get the recipe for because they’re so good. And I’ve wanted to share them with you, because – as they say, sharing is caring. Another bonus is that they are gluten-free, which means even more of you can share in the enjoyment of them. Can we all have a San Francisco-style group hug now? So she came by a few weekends ago, here in Paris, with a nice bottle of Gamay from the Loire and we set ourselves out to make a batch of these Italian-inspired cookies together. Each little cookie is a double-kiss of hazelnut tenderness. They’re so good that I woke up the next morning, determined to wait until at least mid-day before popping the lid on the container. But unable to control myself, I had a few while I was preparing my morning café au lait. And a few more after breakfast as well. The dough is a little different to roll out than you may be used to, so it’s best to keep it cold as much as possible while working with it. 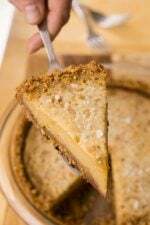 It can be a bit sticky because it’s so rich in hazelnuts, which is why they taste so good, but it does come together nicely with just a bit of kneading and coaxing. 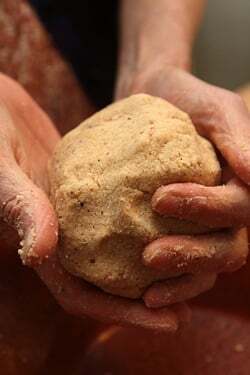 For those who are persnickety about making sure each cookie is perfect, you can certainly spend the time to roll each bit of dough in a nice little ball, which will spread out ever-so-slightly when baked. Then they firm up into crispy mini-domes, ready to fill. Rice flour is used in these cookies, which I get at my local natural foods store and one can find it in Asian markets as well. However the recipe will work with regular white flour if that’s what you have on hand. However rice flour gives the cookies a delightful crispness and I think when you taste these, you’ll find yourself stocking rice flour in your pantry, as I’m going to start doing as well, now that I (finally) have this recipe in my files. Recipe by Terresa Murphy of La Cucina di TeresaToast the hazelnuts in a 325ºF (160ºC) for 10 to 15 minutes, until they’re a deep golden brown color and the skins are peeling away. Remove from the oven and as soon as they’re cool enough to handle, rub the hazelnuts in a tea towel (or if they’re not too hot, with your hands), until as much of the loose skins come off as possible. Let them cool completely before grinding them up.Terresa also says you can use almonds, which can be skinned by plunging them into boiling water for a minute, then draining them. And as soon as they’re cool enough to handle, pinching them to slide off the skins, then toasting them.UPDATE: A couple of people noted in the comments that they had a bit of trouble coaxing the dough into a cohesive mass. It was recommended that if that happens, adding a small amount of water or a touch of butter (perhaps melted), is enough to bring it into shape. I haven’t tried them – or found them necessary – but if you do, I would add the smallest amount possible to bring the dough together. I posted some links to sites that have made them successfully after the recipe. 2. 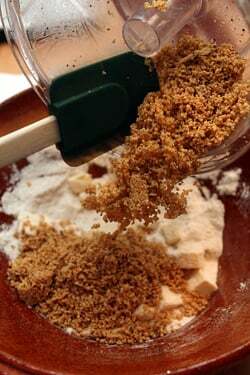 Transfer the ground nuts to a bowl and add the rice flour (if using all-purpose flour, sift it in). Cut the butter into pieces then add the butter, sugar, and salt to the dry ingredients. Use your hands to mix all the ingredients together until the butter is dispersed and completely incorporated. The dough should be very smooth and hold together. If not, knead it until it does. 3. 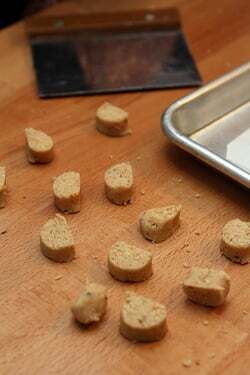 Divide the dough into three equal pieces and roll each piece until it’s 3/4-inch (2cm) round. Try to get them as smooth as possible, with no cracks. 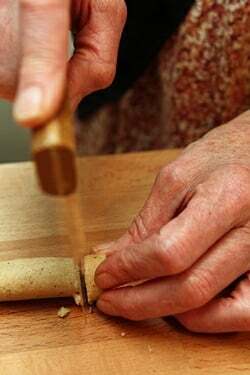 If the dough is too long to work with as you roll them out, you can cut the dough at the midway point and work with it in batches. 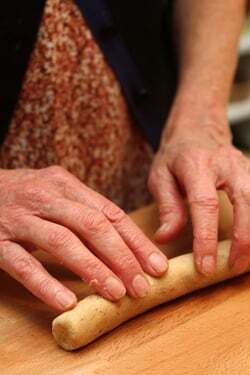 Chill the dough logs until firm on a small baking sheet or dinner plate lined with plastic wrap or parchment paper. 4. Preheat oven to 325ºF (160ºC) and line two baking sheets with parchment paper or silicone baking mats. If you don’t have a scale, simply roll the dough to the size of a marble, trying to keep them as similar in size as possible. 6. Continue cutting the dough and rolling it into little balls. Bake the cookies for 10 to 14 minutes, rotating the baking sheets in the oven midway during cooking, until the tops are lightly golden brown. Let the cookies cool completely. 7. In a clean, dry bowl set over a pan of barely simmering water, melt the chocolate until smooth. Put a chocolate chip-sized dollop of chocolate on the bottom of one cookie and take another cookie, and sandwich the two halves together. 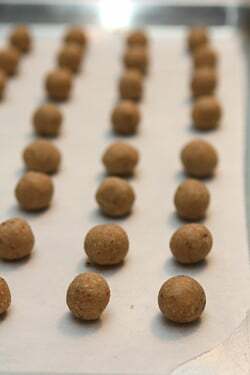 Once filled, set the Baci di Dama sideways on a wire cooling rack until the chocolate is firm. Storage: The cookies will keep in an airtight container at room temperature for up to one week. 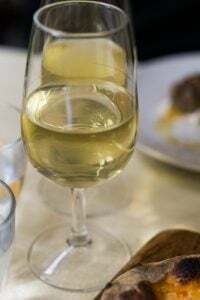 Visit Terresa at her site, La Cucina di Terresa, which focusing on vegetarian cooking classes and natural wine tastings in Paris, and follow her on Facebook. 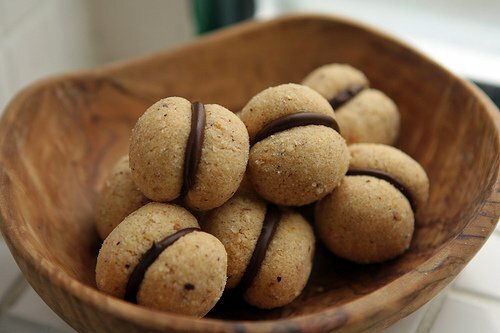 There are many recipes of Viennese Christmas cookies made with ground nuts (filbert, almond, walnut). I used to have a hard time with these doughs, but not anymore. Ever since I use Irish Kerrygold butter, the dough is so much smoother and easier to roll out. Kerrygold is available, at least in the Washington DC area, at Safeway supermarkets and Whole Foods. Here in Vienna, most supermarkets carry it. mmmm… Hazelnuts and chocolate and such a tiny cute shape. Win. I’m so glad I’m not the only one who weighs biscuits before cooking (although it’s mostly to stop the kids arguing over which is bigger and not cause I’m a little OCD..) – and these look like a brilliant gluten free option for friends. Magic timing! Claire: I actually invested in spring-loaded ice cream scoops in various sizes, include rather small ones, because they make forming cooking and doughs much easier and faster. And you can get them all the same size without any extra effort. I will definitely try these cookies this holiday season! However, I don’t think they will keep for a week at my house! These look wonderful — I’ve been dying to make them ever since I tasted a similar cookie at Il Sogno in San Antonio. 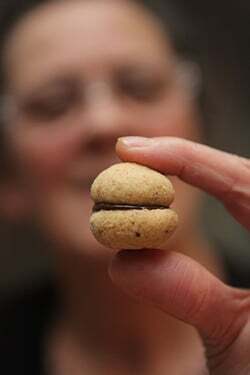 Their version is hazelnut meringue put together with nutella, but they call their version baci di dama as well. Wondering if the name refers to a little cookie put together with chocolate? I found a similar meringue recipe in Alice Medrich’s dessert cookbook a few years ago but can’t remember what she called them. Thank you — think I will try your version! I think I’m in love. They look amazing. Thank you David and Teresa for sharing these! I will have to find some rice flour and make them pronto. These look insanely delicious. Looking at the ingredients list…I can’t believe how simple they are! Must be super hazelnut-y. Can’t wait to try them. Every year I add a new recipe to my Christmas cookie file. This is sure to be a contender! Thanks for sharing. I love the simple ingredients and how cute they look. will definitely give it a go! What perfect timing. I was just researching recipes for egg and gluten free sweets. I want to make some nice treats for my kids friend who has allergies. I would imagine that with the multi-cultural population of Dubai – you wouldn’t have any trouble finding rice flour. Asian markets usually have it and often shops that specialize in Sri Lankan or Indian foods also carry it as well. Anything made with hazelnuts get both thumbs up from me. 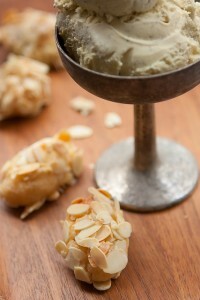 I am gluten free and craving somethings just like this! Just moved to Ecuador, 8400 ft, any suggestions on how to adjust this for high altitude? Thanks! I’m not an expert on high-altitude baking but since they don’t rely on leavening, I would imagine they work just the same. However if anyone else has tips or has anything to offer about how these might behave at high-altitudes, feel free to chime in! The dough itself reads like (Name a country) Wedding Cookies! I make a similar cookie using ground almonds. I’ll have to try filling them. I love that these use rice flour for a gluten free treat. We call them Baci di Giuletta here and they are a holiday mainstay. I am loving the idea of the rice flour for my gluten-free friends. All those luscious hazelnuts … waiting to be peeled. 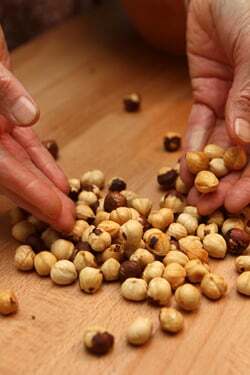 David, any notes on how to skin hazelnuts easily? What gorgeous little cookies, no wonder you couldn’t resist. Love that they are gluten free too. OK, you have brought me to my knees with the idea of these delicious morsels! I will try these tonight, and they will not last the weekend! Thank you for the great stories and greater recipes! Those are lovely! Thank you for sharing the recipe. 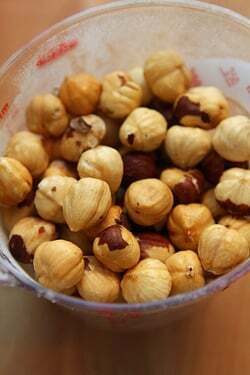 I love hazelnuts and I’m going to try making these for the holidays. The fact that they’re gluten-free is a plus and I totally can relate to having a bottle of wine close by when cooking or baking, it’s a necessity! A little embarrassed to admit that I am not the biggest hazelnut lover. Would these work with almonds or walnuts? Yes, almonds will work fine. I gave a bit of information on how to swap them out here. 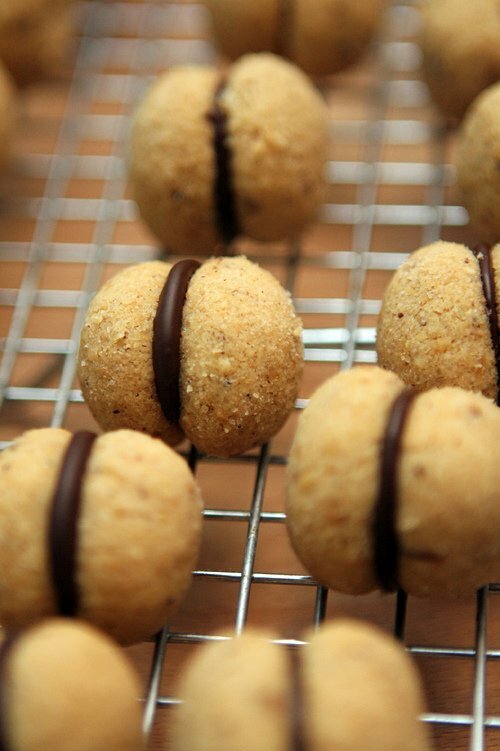 You had me at “a double-kiss of hazelnut tenderness.” Love, love these cookies! 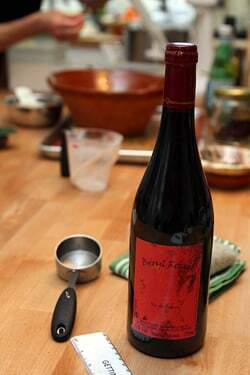 As a bona fide lightweight, envy you & Terresa for your ability to enjoy a little wine as you cook. A few sips for me and you’re far more likely to find me ballroom dancing with flour sack than baking with it. This is a lovely recipe that I’m excited to try, by the way. Anything that is described as “so rich in hazelnuts” gets a test in my kitchen… sans vino, of course. WOW, gotta love it, they sound amazing and are already gluten free so I don’t have to do any converting. I am definitely trying these out! They would make a great addition to my Christmas cookie plate. Stunning photos. 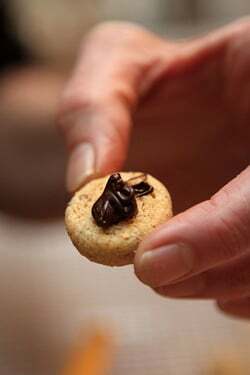 I’ve never seen a recipe for Baci di Dama that had rice flour in it, but it makes perfect sense. I use a bit of rice flour in shortbread, and it does wonders for the texture. Although in shortbread it’s combined with regular AP flour; it will be interesting to see how it works with nut flour. Thank you for another great recipe. 140g (1 cup) of whole nuts might yield about 1-1/4 cups fine flour, so does 1-1/3+ cups seem right for this cookie? I ask because I already have the ground nuts. Can I get in on that group hug? I love these, haven’t had them in way too long. I recently started playing around with rice flour and I agree with you. I’m narrowing down my varieties I’m making for Christmas, I think I’m adding these. It’s good to see a new (Italian-inspired) cookie…I grew up on them and am still hunting down recipe notes my mom and grandmas left behind. 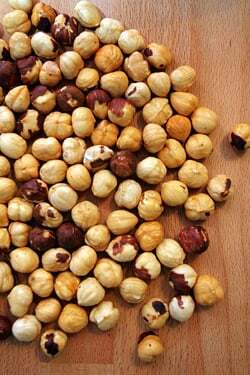 Love the flavor hazelnuts bring – I’m looking forward to making these this Christmas. OMG, these sound delicious! It’s like Nutella in cookie form. I will definitely be adding this to my holiday baking list this year.Gluten free is perfect, too, since I have a friend who was just diagnosed with celiac. Desserts that are GF and taste good are hard to come by. She’ll love them! Amazing!! Totally a must-try this holiday season! Thank you for this recipe! It will be perfect for a cookie exchange party I have coming up! I can’t wait to give these a try!!!! Thank you both for sharing this recipe! What a delicious addition this will be to my usual holiday cookie line up. I keep my rice flour in the freezer, it is wonderful to use in pizzelles,shortbread cookies, or any cookie that you want to be crispy. Now, I need to buy some hazelnuts. Thanks for sharing this lovely recipe! Any suggestions for a nut that would be a proper substitute, which would give similar rich flavor and nutty texture? Allergic to hazelnuts. (Walnuts not an option – allergic to those too) Would pecans be too pecan-y? Cashews? Macadamia? Almonds would work very well. They should be skinned, and to remove the skins, drop the almonds into a small pot of boiling water for about a minute or until the skin starts to loosen. Drain and rinse, then slip the skins off. Sorry… This looks perfect. Not sure I will share! I was going to use the cookie scoop, which I have fallen in love with especially this time of year, so thanks for the note above! Really David, you are so funny . . .LOL ! ! ! 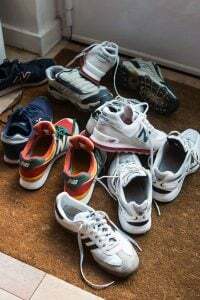 It should have read If you are lucky, and no one else in the home discovers them, they may last 24 hours. Thank you for all the wonderful posts you write. These look marvelous for Christmas (or anytime really). I just wish you had a print button next to your recipes. I would love a print button, but someone would have to go back through all of my posts and archives and reformat them, which is a long (long) process. There are sites like printwhatyouwant.com (among others) that let you print out individual webpages. On my way to the store for hazelnuts and rice flour!! These look delightful! 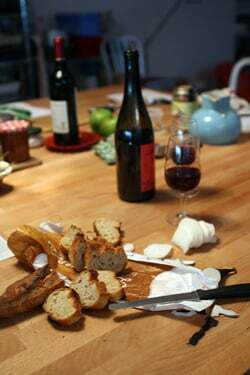 I wanna have a friend who comes over with a bottle of wine to make cookies, too. Preferably in Paris. Sigh. Hi David, These look amazing! Do I have to temper the chocolate? No, you can just use it as indicated in the recipe. It’s easier. I’ve wanted to make these ever since I got Gina DePalma’s book (and consumed plenty at Babbo throughout the years). I may just have to add these to the christmas cookie list this year! Thanks for the inspiration! I am definitely going to make these for Christmas. They are like a little choc Italian Christmas hug! Yummm! I am so happy to read this post as I am making my grocery list. These little cookies are like Nutella without the palm oil! I don’t think I’ve ever called a cookie pretty before, but those cookies are really, really pretty. How many days can you bake the cookies ahead of time before piping in the chocolate? I would like to make them a few days before Xmas and on Xmas day pipe the chocolate. Thanks for the wonderful recipes — they always won raves with my friends and family. Amazing post as always, thank you. can you use sweet rice flour (mochi flour) for rice flour? Is that the same?? These look amazing. One question – could you use hazelnut meal (i.e. Bob’s Red Mill) in lieu of roasting and processing the nuts, or would the texture be too fine? If it is possible, any ideas on quantity? I would love to print this for my collection. Can’t find where to print. I just get the beautiful picture in the bowl. Can you rescue me ? Probably many of you know this already, but if not, you can print the page by highlighting the entire recipe, copy. Then open a new document in Word or Pages and paste. The recipe will be there and you can either print or save to your computer or dropbox where I keep all of my recipes. If you save all your recipes in Dropbox you can access them from any of your devices. 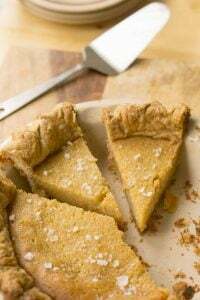 Hazelnut flour is an outstanding substitute for peeling and grinding your own, with better results as well- have been using it for years for holiday linzertortes. Yay! Thank you, David! Love your blog, and so glad you replied. So many delicious recipes for holiday baking involve hazelnuts and walnuts (the latter, especially – and boy was I sad visiting the Dordogne, those beautiful trees), but I just skip over them never being quite sure what taste a different nut might impart, or add pecans instead (but that flavors not always right either). So I appreciate your insight. Thanks! Whole Foods in Texas. If you are just experimenting with a recipe like this easy to purchase just enough needed. This cookie looks yummy, thanks! Would store-bought hazelnut meal work, or would it be too fine a grind? Also, can the dough be made in the food processor without any adverse effects? I would love to make these for my holiday party, but since I’ll have a lot of cooking to do it would be great to use some shortcuts without affecting the quality of the product. 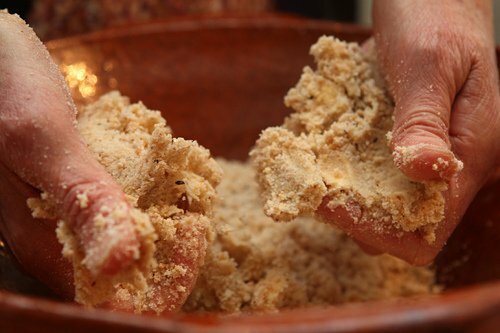 A number of folks have asked about using hazelnut flour (sometimes called ‘hazelnut meal’) – I think that might depend on how fine the hazelnut flour is. I put a picture of the ground hazelnuts that Terresa used for these cookies, so folks could see the texture, and they were great. You could check it against the hazelnut flour that you have. I haven’t tried it so can’t say for sure, but if you do try it, please let me know how the cookies turn out. 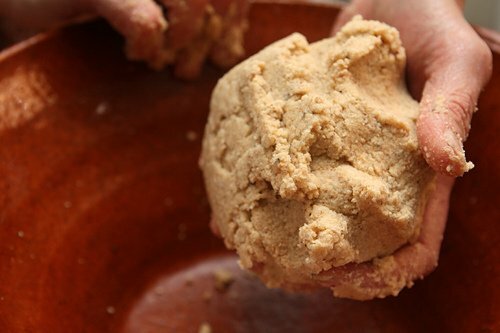 However since the ground nuts are an important part of the cookie flavor, I do strongly suggest that you use ground hazelnuts, (or almonds), as indicated by the recipe for best results. Nuts lose their flavor quickly when ground in advance. For more information, read Baking Ingredients and Substitution. for the gluten free folks who also go grain free: an excellent substitution of rice flour is tapioca flour, light and crunchy! just be sure to go by weigh (140 gr) not by volume (cup). These are cute! I’m not that big on chocolate so I wonder what else might be a good filling. Maybe some sort of jam, marmalade, or something along those lines? 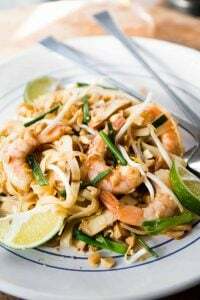 Can one use brown rice flour? Would that make a difference in the baking? The flour that I use is called Farine de riz complet, which is brown rice flour (although it’s white) – which is what we used. You can see a picture of it in the post for Chocolate-Caramel Tartlets. Can’t wait to try these, I too look for gluten-free and egg free cookies which are fabulous. When I do use eggs I use duck eggs as they are much more agreeable to my belly than chicken eggs. I hear that the French bake with duck egg, but have never seen recipes for them. Do you have any insight or advise? I adjust for the difference in volume and go and get a reasonable product usually. But duck eggs are proportioned differently than chicken eggs, a giant yolk with less white which is beautifully translucent. Love to hear any thoughts on working with duck eggs, hard boiling them has been the worst! Thank you, thank you, thank you. I love that these are gluten free and will ease the burden of finding gluten free options for my child. They look delicious. I was so surprised and happy to see the rice flour instead of the all-purpose white flour. I can’t wait to make them for my gluten-free family members!!! They look delicious! This comes at a great time of year with the Christmas holidays when I can no longer make all of the old traditional gluten filled cookie recipes. Thank you so much. What a strange coincidence. I saw these for the first time today at Whole Foods. They have a selection of holiday cookies that look homemade – these, macaroons, thumbprints etc. A good idea for people who can’t or choose not to bake. Anyway I’d never seen them before today and now I discover how to make my own on your site! Awesome. I must add these to my Italian cookie spread for Christmas. Thinking there must be a trial run this weekend! Thanks for a simple, nostalgic recipe David. I was wondering, can I make rice flour by blitzing rice in the blender? I’m suggesting using the sugar to powdered sugar trick. Or does rice flour have to have some specific type of grain or consistency to work? I can’t wait to make my own this weekend…. you mean they don’t group hug in paris?? i am shocked! :) what beautiful little cookies! they look a little like macarons, but even better…(i like my cookies with more butter than less). very excited to try them. p.s. any suggestion about bombay ? Hi David, I would love to make these. I have a query though, do you have a suggestion for an alternate filling instead of chocolate. I know hazelnuts and chocolate are the perfect pairing, but I wanted to try these with a different flavour filling. 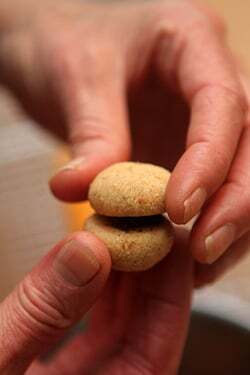 Ambika + Schweet: You could use fondant, a bit of nut butter, or some a drop of stiff jam as filling. gu: Because of the flak whenever I post a recipe from a certain country, like these cookies, I am certain that someone would come forward and suggest that there is something not traditional about the recipe, for whatever reason. So I unfortunately have to choose words carefully to avoid conflict. Alison: I’ve never done that, but if you do, let us know if it works out. Anne: Although I see duck eggs at the market, I’ve never been served anything in France made with them. I would imagine they get used for things like omelettes and scrambled eggs (they make excellent Mexican huevos ranchero!) But I don’t know any French recipes that specifically call for them. Sorry that I to have been so fussy. While i’ve never tried a Baci di Dama cookie, i’e seen plenty of recipes and none of them look so appetizing as this! Hazelnut and chocolate, yum! I’ve been making quite a few biscuits and cookies of late, a coffee and almond biscotti on Monday and Greek almond shortbread (kourabiethes) yesterday! I guess I know what’s next! I cannot wait to try these. Thank you! Try adding just a pinch of roasted and ground fenugreek seeds to the hazelnut powder for a real touch of exoticism ! you are speakin’ my language. just lovely. Tres beau, comme d’habitude. These past 10 years, I made a version of these called “sleigh bells”, but I am going to try these ones this year, because the rice flour intrigues me. You are the best David, thank you for sharing. Would these freeze well for 2-3 weeks? Thank you, David, for another excellent-sounding recipe. You are so thorough. I cannot understand how anyone who read the whole thing would miss your detailed comment about substituting almonds and how to prepare them. !!! As for infinite substitutions, especially in the flour department, some of the things mentioned are not “flour” and will give a different result. Which may be fine. The individual should do their own experimentation. The rice flour sounds good for the reason you stated. Crispiness. As I recall it is the flour used in Asian tempura that gives such a light crispy “breading”. David, you also get very high marks from me for your infinite patience. This recipe is beautiful in its simplicity. With the holidays coming up (not that cookies ever need an excuse), what a beautiful treat you’ve shared with eaters of all sorts. Bravo! Got all the ingredients and ready to go! One question: why do you place the filled cookie on their sides on the rack? Is it to avoid an imprint in the cookie? From the photograph it looks to me as though the filled cookies are more stable on their sides as their tops and bottoms are rounded. Less apt to roll around while the filling sets up? I made them this afternoon and just tasted the first cookie – they are exactly as wonderful as you said. Thank you so much for this recipe! In my oven I had to let them cook a tiny bit longer though, about 20 min at 160C. These are now on my Christmas cookie list! I wonder if I could make them, roll out the dough and then freeze them for baking later. I like to freeze unbaked cookies a week or two before I need to give them out. Do you think baking the frozen dough would cause a problem with their shape/rise/spread in the oven? So thrilled to have this recipe, David. Thank you and Terresa for them. I have to do a lot of gluten-freee baking for my family and am always looking for new recipes. I am so excited to try these. Merry Christmas. Have you had any experience substituting Pine Nuts when baking (instead of almonds or hazelnuts) Both of my children are allergic to peanuts and tree nuts, but the delicious and ridiculously expensive pignoli (which is a seed) is a-o.k. Almonds, walnuts, hazelnuts, pecans, etc., are all edible seeds of the trees that bear them. So are pine nuts. Pine nuts are usually on the forbidden list for anyone allergic to any other tree nuts and/or peanuts, which are legumes (sometimes called “ground nuts”). Interesting that pine nuts would not be a problem for nut-allergic children. nadine: Pine nuts are very expensive, as you mentioned (and one should be careful about which pine nuts they buy because of pine nut syndrome) – so I buy ones from Europe. Plus their flavor is very strong, so I wouldn’t advise using them. SP + Ruth: I’ve not frozen them but give it a try! David and others, here is a list of companies and brands that have had reported cases of PNS (Pine Nut Syndrome). In the article that led to this one, the writer remarked that Trader Joe’s had had reported cases of PNS even though its pine nuts were from Russia and Korea, so it must not be limited to China. This study ended in 2011, but appears to be the most current info out there. It may also be out of date by now as retailers changed out their pine nuts to other sources? I’m definitely making these for Xmas. Wonder if I can use Nutella for a filling. I have a jar that I don’t want to just eat by the spoonful. Yes! I have done these, and macarons, many times with Nutella. Love it by the spoonful too though! I love that you blogged on these and the photos are beautiful. However, for readers who may also be inspired to try this recipe: I strongly urge you to use all purpose flour, especially if you do not have dietary restrictions. I love Baci di Dama, but I do not care at all for these and I blame the flour. They are adorable, but I don’t know what to do with them now! Great recipe; made yesterday to accompany a pear clafoutis for dessert. Made even easier: simply ground nuts in food processor, then added remaining ingredients to processor bowl and spun until dough came together. I would imagine that for those that want to avoid chocolate (! who are these people? ), a coffee flavoured fondant would work well. I have some lovely toasted hazelnut flour from King Arthur Flour. It looks just like your picture of the ground, toasted hazelnuts. Do you have an estimate of how much you ended up with when you ground your own? Thanks! I included a weight for the hazelnuts so you could try using that as a guide. Just made them. Hard not to eat the dough that was stuck all over my hands. They taste devine. My dough did not hold together very well, which made trying to form pretty little balls quite challengeing. Although I don’t mind the less aesthetic look, I am wondering if I missed something. I did kneed it after running it in the mixer to combine it for about 5 mins. Weighed out everything; nuts were ground as described; the only rice flour at my local store was a ground brown rice flour… could that be it? My problem? Trying to figure out how much butter to use in North American (non-metric non-scale owning) brain standards. 100 grams, folks, is 1 stick of butter. I used double that. WHOOPS! Made for flat, buttery, delicate little cookies that wouldn’t have had a chance if I stuck chocolate in between them. Will try again soon! Mixture was quite crumbly – but it held together well enough for me to make neat little balls and pop them in the oven. But when I took one out after 15 minutes it just crumbled into a little mess of doughy crumbs. After 20 minutes they were no better. I had a similar problem as Sarahb1313. The dough would not stick together, even though I tried kneading the dough togther. Should I add a little water to the dough to bring it together? I cooked my second batch for about 12 minutes and they were a little better. But they definitely could not be described as light and crispy or ‘moreish’. The rice flour gives a very dry, solid texture. Would more butter help? Milk? Water? I cannot get brown rice flour so I used white rice flour. I could have used glutinous rice flour (mochi flour) instead. Would that change the texture? 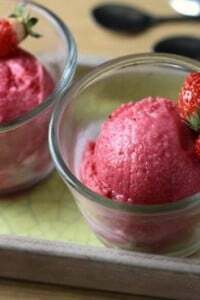 I notice also that there are three copies of Terresa’s recipe on the net. Identical ingredients but differing cooking times: 10-14 minutes, 15 minutes and 18-25 minutes !! Nancy, Sarah, and Jay: The dough definitely requires a bit of kneading and coaxing, but as you can see in the photos, we didn’t have much trouble getting it to come together. Am not sure why yours didn’t but I’ll ask Terresa if she can respond if she’s available. The dough definitely did not look as “moist” and able to work together. I wonder if just a tad more butter- 100 gm was about 1tbsp shy of a full stick. So wasn’t able to make logs. BUT when I put the second half of the dough in the fridge overnight, although I still couldn’t work it easily without falling apart, I was able to make somewhat neater little balls. So I think for whatever reason the quick freeze did not work for me. To an earlier poster- they are completely crumbly when taken out of the oven, but after at least an hour or two, were really fine. They are delicate. I think I was a little impatient in trying to work the dough. And the dough was a bit drier than it should be. But the end product seems a bit closer to intended now. I can’t wait to try this recipe. I would like to know if anyone has tried a combination of brown rice flour AND regular unbleached (wheat) flour. How would that be? I don’t want the dough to crumble at the touch once baked, like some have referenced, yet haven’t made these yet to know if the combo of 2 flours would work. Any thoughts? I’m totally new to your blog, David, and I just love it! I’m hanging on to my memories of my summer visit to Paris, so your blog is wonderful! I’m looking into how to spend next summer there. Would love to attend something that you present. Thank you for sharing these! I was just getting ready to make cookies for the holidays, so I started with these. After reading the comments, I made sure to knead the dough quite a bit–if I hadn’t known beforehand about this issue, I may have given up too soon. It was pretty crumbly and took a while to roll the logs without them falling apart, but I did it! I used the quick freeze method and it worked quite well. When forming the balls, I avoided rolling them in my palms until the dough had warmed up a bit and was more pliable (some of them did fall apart in my hands when I rolled too soon). I baked them for 7 minutes, rotated the baking tray, then baked another 7 minutes and they seem just right. They’re adorable and I’m pretty happy with how they turned out! Oh, and for the record, I used all-purpose unbleached white flour, rather than rice flour. I made these cookies today. The recipe is very time consuming but well worth it. I found that putting the dough into the fridge helps you work the dough (both when rolling into logs and then again when you need to cut and form into little marbles). If you let the cookies cool on the sheet before you take them off, they will not crumble. These cookies are delicate but worth it. Try these suggestions and see if they help. I would have liked more cookies from this recipe (and for all the work put into it), but now I know why all those little Italian cookies are so expensive (very time consuming). You need a little patience with this recipe, and it will all work out. I cheated. I used regular flour & dry roasted hazelnuts because that’s all that was available in my little backwater of a town. It is a crumbly dough and there were no easy to cut logs of dough. I threw the whole thing into the refrigerator to chill. Rolled them into irregular shaped balls. Dipped them into melted chocolate afterwards. They didn’t turn out dainty and perfect like the photos. But they taste great! My husband has already eaten 6. The recipe’s ingredients are probably of a higher quality in France, I would imagine.Thanks to Jennie B. for the amount of butter breakdown. Pine nuts do have a really strong flavor, but if that didn’t bother you I’d also consider using ground sesame seeds. These look delicious! I usually bake a version with ground almonds and wheat flour but I am definitely keen to mix up my combinations and start playing around with hazelnuts and rice flour. Same result as many others with excessively dry dough that was totally unworkable. Gina DePalma’s baci di dama from Dolce Italiano are easy to prepare and work. As readers can see, the dough worked well when we made it. And as mentioned, it’s not a typical dough and needs a bit of coaxing. However we made these cookies together and they turned out great. I used white rice flour and though the dough didn’t hold together well enough to roll into logs, it held enough to shape the small cookies. Yes, it does take a bit of kneading to get to shape-able point. Baked for a total of 18 minutes and they were fantastic. I made these over the weekend and they turned out wonderfully. I followed your directions and knew what to expect with the consistency of the dough (thanks to your helpful photos). To break the process into stages, I made the dough and chilled it overnight; cut, rolled, baked, and cooled the cookies in the morning; and then did the chocolate filling in the evening. I used Mast Brothers chocolate. Thanks so much for the recipe–they make great little holiday cookies! These cookies look fantastic! Do you think they would work as well with walnuts? made these today and they are delicious and unique! the dough felt “dry” but I just added a touch more butter before i rolled them up to chill (even then, the dough was a bit crumbly, so I couldn’t get the dough into perfect cylinders–more like triangles with rounded corners). thank goodness David pointed out that the door wasn’t typical, so I wasn’t too freaked. and it’s no biggie, because you get a chance to roll the dough pieces up into balls after chilling. i formed the balls with my fingertips. i worried that the dough wouldn’t hold through baking–but guess what: after cooling down, they were perfect! and delicious. i would so make these again–great if you don’t want a super-sweet cookie. Update– I added a few pats of butter to my crumbly dough and re-kneaded the dough. That helped a lot. The dough came together enough for me to pat out a log and cut it into small pieces without it falling apart. Just be sure to make sure the extra butter is well incorporated. I got impatient and a couple of small lumps melted while baking and the cookie looked like it was bleeding ground hazelnuts. Oh well, something for me to eat! Very tasty cookies, I can’t wait to add the chocolate component! Hi David, love the recipe. Can I use a different nut like pistachio or macadamia, instead of the hazelnuts? Nothing against hazelnut but only have other nuts in hand. Thanks!! 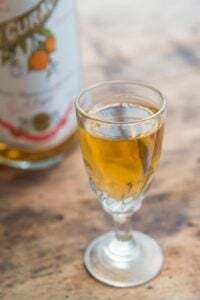 Stock management is the most delicate part of these ‘Baiser de la Dame” recipe! Such an easy recipe and so well explained. I’ve used the food processor all along to mix ingredients and no rolling as I found it difficult, but pressing and gently stretching the dough after a short stay in the freezer was the answer. The size of a marble is just right, and make sure to let the cookies cool down before touching them when they come out the oven, I was too impatient and they simply crumbled down! Thank you David for sharing and giving away your knowledge and your enthusiasm. One filled 15ml measuring spoon gives the perfect amount of mix to make two little balls. It enabled me to bypass the rolling into a log step which didn’t work for me as it just kept crumbling apart. For the filling I used some dark cooking chocolate and added some cinnamon, which gave a little cheeky hint of spice! ChristineZ: Thanks for the photos and glad you liked the cookies! shelley: I’ve answered in previous comments about other nut substitutions so you can scroll up and read those, which may require you to hit the ‘previous comments’ button – if you do try another nut, since I’ve not tried one, please let us know how they turn out. They look delicious!!! I want to bake them already, they look so easy and tasty, thank you for post them!!! Delicious! I did struggle with the dough being a bit crunmbly, but I managed to keep it together. I cooked them for about 16 minutes. Determined to try with peanuts next time. I tried twice and both times the dough really spread out in the oven. They looked nothing like the little dombs in the photos. The second time I even popped the unbaked balls in the freezer for 10 minutes before baking but they spread just like the first batch. I weighed all the ingredients. The batter looked like your photos, maybe a bit wetter. I should have added that I baked balls of dough on parchment paper. Also I use an oven thermometer. Mike: Mine didn’t spread, and another reader had similar results the batch show in the photos here. You can check out my post, How to Keep Cookies from Spreading. Thank you for your reply. I was aware of your cookie spreading post (I’m an avid and regular reader of your blog) but will review it again. PS, in my local pastry news, Payard opened up a new shop (again. his old one went kaput) on the Upper East Side of Manhattan about one month ago. Across the street from Maison Kayser (a Parisian bakery or so I’m told) which also opened recently. So next time you are in NYC you might want to check them out. I’m having the same problem as everyone else. The dough is super crumbly and no amount of coaxing is going to get this to roll into a log. Per the suggestions above, I’ve put it in the frig for awhile to see if that’ll help. If not, I hope I can re-purpose the dough for something.. skinning the hazelnuts was a pretty labor intensive process. You basically wrap up the just-toasted hazelnuts in a tea towel like a little package, then rub them together vigorously. Not every hazelnut was skinned, but that didn’t seem to be a problem after grinding in the food processor and mixing with everything else. Second try- new batch of nuts. Perfect results. I used my nut grinder this time, got a uniform semi-fine grind. No risk of becoming pastey in the processor. If I used the processor again, would add some of the flour while grinding. If the dough was dry, would likely add a little butter. I used the stand mixer both times to do the initial combining work and kneaded the dough for the final step. My guess is the oil content and/or age of the nuts had an impact. My first batch were nowhere near spreading when baked. They were dry. The grinder is just fool-proof. As always, the resulting cookies (both times) were shared and appreciated! Sarah1313: Normally I would grind the nuts with some of the flour, but Terresa didn’t and as some suggested, the moisture of the nuts may have something to do with the consistency of the dough. Laurie: A good use for it would be to stuff baked stuffed apples. As shown in the post, the batch we made came together with some kneading. If you have a bit of butter or oil, you could try working it in to the dough. First batch: I followed the recipe exactly, mixing the dough by hand. Dough very crumbly but after being in the freezer I formed little balls relatively easily. Looked gorgeous – just like the photos – but the texture was dry and solid. Second batch: I used the food processor. Ground the nuts, then threw in flour,sugar and butter and blitzed it. Dough did not form a ball but came together when pressed. Results identical to first batch. Third batch I substituted my commercial gluten-free flour for the rice flour and used the food processor. Bumped the butter up to 110 g. Didn’t form a ball in the food processor but dough pressed together easily into a smooth non-crumbly dough. When rolling the balls my hands became quite greasy. When cooking, the balls spread into flat cookies. However, the texture is lovely – light, crispy and moreish. I have used the same batch of nuts and butter for all 3 attempts. I will try a final time with less butter…….. These cookies turned out wonderful. I was concerned about this recipe bcs of the comments I read and bcs I live in a high altitude area. I used brown rice flour instead of the regular one. The texture and taste are wonderful, and they look so cute. Thanks David for another great recipe! Made a batch tonight and my family totally loved it! Did not have any problem. My dough held together (could it be because I used coconut palm sugar?). I chilled mine in the freezer for 15 mins and the logs came out hard enough to cut into 5-gm pcs. After baking, I waited until the baci are cooled completely before touching any of them. I could tell that they would crumble if I handled them hot from the oven. Would definitely make them again! Thanks for the recipe! These are delicious…wanted to chime in as everyone’s comments helped me a lot. I added couple of cubes of extra butter to the dough, mixed and chilled, and rolled straight into balls a little bigger than marbles so they end up like mini puddings. Rather than sandwiching, I topped each with melted chocolate and chopped hazelnuts and they are perfect. Thanks for the recipe! One more thing to add: these cookies freeze very well! I put half a dozen in an airtight container when I made them on Sunday, and pulled them out today. Left them for just a few hours on the kitchen counter in the sealed container, and they taste just as good. I made these today (7 Dec 2012): they came out pretty nice, thanks! Just wondering: what do you think of using chocolate ganache for the filling in place of melted chocolate? It occurred to me that the ganache might be thicker, thus easier to pipe and get a filling that would set a bit better (my chocolate was a bit too hot when I piped it, so it was pretty liquidy). I had the same initial crumbling issue as others (maybe next time I will try European style butter, which has a higher fat content) but they still came out well in the end. The cookie firms up nicely after cooling from being in the oven. I made these twice and they turned out super. Both times I used rice flour as we have no trouble getting it in India. Next i will try with plain flour but I think the light crunch u get is because of the rice flour. I made this lady’s kisses today, and i followed the recipe all the way through, except for the butter. i had no unsalted butter at home, so i used salted butter minus the additional salt in the recipe. it turned out great, no problem with the dough. i tried putting it in the fridge, but couldn’t wait, so i did your way, put it in the freezer and it worked. it was tricky though but with patience, especially with the rolling into balls. i just used very light pressure to roll them. my only question is, though may sound daft, is 160C in conventional oven or fan oven? i used fan but reduced it to150C which took longer to bake, which also could probably be because mine weighed 13g each.it was yummy, thanks for the recipe. Just made these to bring to a Christmas Cookie exchange next week. I have frozen them as recommended in one comment. I think if you have a food processor it is the way to go, they come out in a good consistency to roll into a log. I used wax paper to roll the dough and then put them in the fridge wrapped in the wax paper. They were easy to cut and roll into little balls afterwards. In my gas oven, I found they needed 15 minutes. Thanks for the recipe! “the importance of having a bottle of wine handy, no matter where or what you’re cooking…or baking”….i am quite certain the wine helps with the chilling (out) and rolling (with it). these are tasty. thank you! I made these yesterday and they turned out great. I used half white rice flour and half brown. Yes the dough was super crumbly when first mixed, but I used wax paper to roll each log and a very light hand and after a few minutes it became very pliable. My butter was pretty soft by the time I mixed the dough and I think that helped. I found that instead of rolling each slice into a ball, pressing it worked better. Half of the cookies did spread when cooked; in retrospect I should have chilled them again before baking. So some of the sandwiches are a little flat but they have a fantastic flavor.